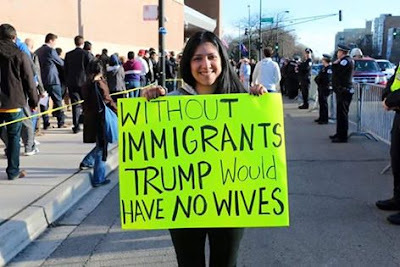 The issue is controlled European immigration (where Trump's wives have come from) vs unchecked (1 million plus a year since 1965) immigration from places that don't share our values and cannot be assimilated into the nation that was founded by Washington, Jefferson, Madison and Franklin. America will cease to exist unless mass non-European immigration (invasion) is reversed. "Without immigrants, Kathryn Steinle would still be alive"
Exactly. They open borders crowd has blood on their hands.